During February, civilian harm claims against the US-led Coalition in Syria continued to be a major problem. The month saw several alarming large-scale casualty incidents in the town of Baghouz – the last territorial holdout in Syria for so-called Islamic State (ISIS) – meaning that the likely death toll from Coalition actions in February rose by 27% on the previous month. Alarmingly, the February also saw a tripling in claimed deaths from alleged Russian and/ or Syrian government actions on January’s estimates. As Assad’s forces stepped up their campaign against rebel forces in north-west Syria, Airwars tracked six reported casualty events in the town of Khan Sheikhoun, Idlib. While the majority of sources attributed the civilian harm to regime artillery, there were also allegations against Russia. Up to 56 civilians were claimed killed in contested events implicating both the Assad government and Russia in February – compared to a maximum of 18 such deaths in January. During February, ISIS’s former extensive ‘caliphate’ was reduced to just one town in eastern Syria, Al Baghouz. On February 9th, following a week-long pause to allow civilians times to flee, SDF ground forces backed by US-led Coalition air and artillery strikes, again announced a ‘final’ operation to seize the town. By February 12th, it was estimated that 20,000 civilians had fled ISIS-held areas within recent weeks. By February 16th, ISIS was now reportedly cornered within a 600-700 square metre area of the town. Thousands of civilians still remained trapped, taken as hostage and used as human shields by ISIS or simply refusing to leave – once more postponing any declaration of victory. A slowdown in the SDF’s advance was reflected in Coalition strike numbers in February. A total of 365 air and artillery strikes were conducted in Syria from January 27th to February 23rd according to official data, a 70% fall on the previous four week period. Munitions dropped from the air also fell by 70% on January. According to AFCENT, 607 air released bombs and missiles were fired across Iraq and Syria during February – compared to 2,005 munitions the previous month. This steep fall in strikes may be misleading as an indicator of the intensity of Coalition activity within the tiny Al Baghouz pocket. An Airwars analysis of both strikes and engagements in the so-called MERV indicates a higher tempo of Coalition actions in Syria in the first two months of 2019 than were recorded at Mosul during March 2017, the most intense and deadly period of that battle. The Coalition had that month declared 152 strikes on the city, an average of two strikes per day. Even in February 2019, – a month in which Coalition actions dropped steeply – there were still on average over two and a half times as many strikes per day reported in Al Baghouz than were seen at Mosul. The intensity of the Coalition’s assault often placed civilians on the ground in grave danger. Indeed, Airwars tracking indicates that the number of civilians likely killed by Coalition strikes in February rose by 27% on January’s minimum figures. Our current estimate is that between 76 and 128 civilians were slain in Coalition actions in Deir Ezzor throughout February. This rise was largely the result of one catastrophic mass casualty event in Al Baghouz on February 11th, which reportedly killed up to 100 civilians – and was the worst reported Coalition civilian casualty incident tracked by Airwars in Syria since June 2017. As strikes continued to rain down on the town, Airwars once more urged the Coalition to take better steps to protect the most vulnerable Syrians on the ground, while Human Rights Watch expressed grave concern for those attempting to escape ISIS during its last stand. On February 19th, the UN High Commissioner for Human Rights warned that hundreds of families were still trapped in the Baghouz pocket and called for safe passage. For those who did manage to escape, the humanitarian situation remained bleak. The UN estimated that since December 2018, approximately 45,000 people – many of them women and children – had fled the Hajin and Al Baghouz areas, arriving at the Al Hor camp in Hassakah malnourished, sick, and in dire need of medical attention. While there was a sharp drop in actions in Syria in February, for the second consecutive month, air and artillery strikes in Iraq instead increased. Between January 27th and February 23rd the Coalition reported 45 strikes – more than double the 22 actions publicly declared in Iraq between January 1st-26th. However, with the Coalition having ended transparency for its actions it was no longer possible to determine where these strikes had occurred – and whether they might have caused civilian harm. This was particularly alarming given the relatively steep rise in strike numbers. Actions by the UK and France, the remaining international partners in the US-led alliance, continued to fall during February. The UK reported just two airstrikes in Syria, down from 19 the previous month. Additionally, it conducted one airstrike in Iraq, on a cave ten miles east of Tal Afar. The month also saw the withdrawal of eight British Tornados from the fight – though RAF Reapers and Typhoons remained in theatre. Paris reported six airstrikes near Hajin, a 75% fall on the 24 actions conducted in January. 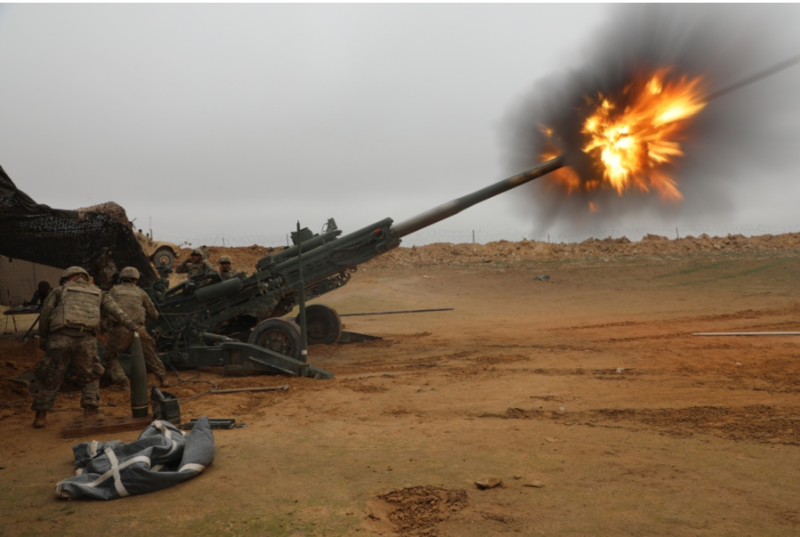 There was also a significant reduction (87%) in actions by France’s artillery forces in the Euphrates Valley: six missions were conducted in February by Task Force Wagram, compared to 114 the previous month. Throughout February, Airwars researchers tracked a total of seven incidents of concern blamed on the Coalition – a 56% fall on the 16 events tracked during January. All seven of these incidents are presently assessed as being fairly reported. An event is assessed by Airwars as ‘Fair’ when it involves two or more uncontested and credible public sources, in addition to confirmation where possible that the Coalition carried out strikes in the vicinity that day. However, the minimum number of estimated deaths across these seven incidents increased by 27% on January’s minimum figures. Airwars’ current estimate is that between 76 and 128 civilians likely died in these seven events, compared to between 60 and 118 civilians likely killed during January. As fierce clashes occurred in ISIS’s last stronghold, civilians trapped on the ground were repeatedly placed in a perilous position throughout February. Of the seven events tracked in the month, four of them were in Al Baghouz. In the first Al Baghouz incident, one woman died on February 1st when the Coalition allegedly struck a residential building in the town. Surrounding houses were also reportedly damaged. One source, Suriye UAD, said that Coalition warplanes had struck a mosque, though no other reports supported this claim. On February 9th, between three and five civilians died in an alleged Coalition airstrike on Al Tayyana town according to local media. Euphrates Post reported that ISIS had attacked the al Omar oil field by motorcycle, after which the Coalition carried out several airstrikes which also killed three civilians and wounded others. Horrya News put the civilian death toll higher, at five. Just two days later, on February 11th, Al Baghouz again came under intense fire, with Airwars tracking three separate and increasingly severe claimed casualty events in the town. In the first, four civilians died when Coalition jets allegedly struck houses on the outskirts of the town, according to sources including Dama Spots and Saba News. @DeirEzzor24 reported that the fatalities included two children and two women (though Elrabi Elyoum instead claimed that four men had died). In the second event, a further 16 civilians were reported killed in Coalition air or artillery strikes. Multiple sources including Al Souria and Middle East Online said the victims included seven children and eight women. One man was also reported killed. Finally, between 50 and 100 civilians were reported slain in another alleged Coalition airstrike on Al Baghouz – making this the most catastrophic alleged event Airwars had tracked in Syria since June 2017. Most sources reported that the majority of the victims were women and children, though only Syria TV gave specific figures, claiming that among the dead were two women and two children. According to SANA News, which is affiliated with the Assad government, Coalition warplanes had reportedly struck a camp for displaced persons though there was some confusion regarding the exact date. SANA placed the incident on February 12th, while LCCSY reported the incident a day earlier. Photo of the news published by A’maq agency, an ISIS propaganda news channel (via Alsouria). There were no known publicly reported incidents of concern in Iraq during February which resulted from US-led Coalition actions. In February, Airwars tracked 11 publicly reported civilian harm events in Syria allegedly linked to Russia – one event less than during January. However, the minimum number of claimed deaths more than tripled on January’s estimates. In total, between 29 and 56 civilians were alleged killed across these 11 February events – compared to between 9 and 18 civilians during the previous month. All of these events were assessed by Airwars as Contested, involving allegations against both Russia and the Assad regime. In most cases, claims against regime artillery outweighed those reports blaming Russia – though there were also allegations that Russian forces were conducting artillery strikes. February saw Assad’s forces ramping up their assault on north-west Syria, with a sharp rise in strikes on towns in northern Hama and Idlib governorates. Of the 11 events tracked by Airwars in February, 64% were in the town of Khan Sheikhoun, Idlib, which the director of the Syrian Observatory for Human Rights, Rami Abdulrahman, said had been turned into “a ghost town”. On February 15th, in what local media described as “a massacre”, up to 14 civilians including up to six children and four women died in alleged Russian or Assad government artillery strikes on Khan Sheikhoun. 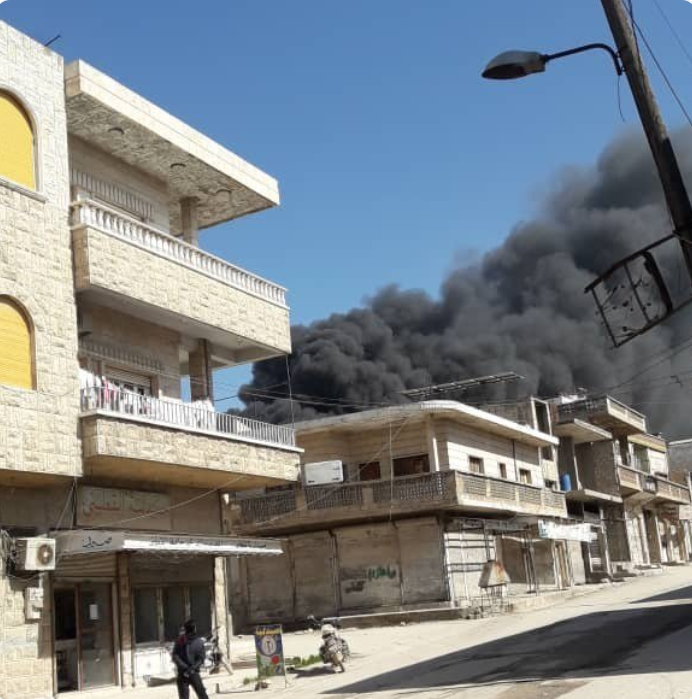 According to Baladi, regime forces “stationed in the village of Abu Dali shelled the city of Khan Sheikhoun with artillery and missile shells” resulting in “a massacre” of eight civilians. Most sources joined Baladi in pointing to the regime. However, Smart News and Kafr Zeita blamed Russia. The White Helmets said that “25 rocket launchers” had attacked the city, and put the death toll at nine. @abuhuzaifa tweeted that children had been burned alive in fires. Sources named multiple fatalities from the Al-Aindani and Al Ayan families among those killed. Four days later on February 19th, in an event again most likely caused by government shelling, another five civilians reportedly died in Khan Sheikhoun. 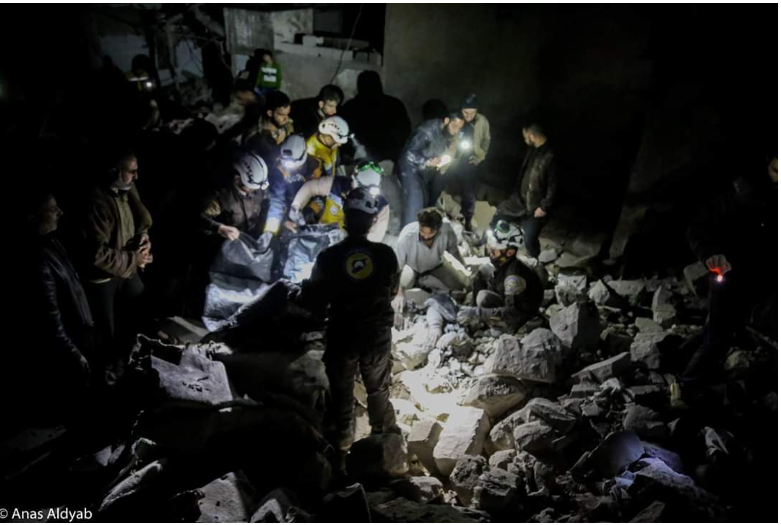 Khaleej Online noted that this was “the third day in a row” that regime forces had bombarded the town, adding that the death toll had now “soared to 20 civilians, mostly women and children” – with “dozens” more wounded. Ahrar tweeted that 50 shells were fired on the town. While most sources attributed the civilian harm to the regime, the Step News Agency noted that Russia was also carrying out artillery strikes. Strikes continued to rain down on Khan Sheikhoun for the remainder of the month, and on February 23rd as many as seven more civilians including two children and two women were reportedly killed. 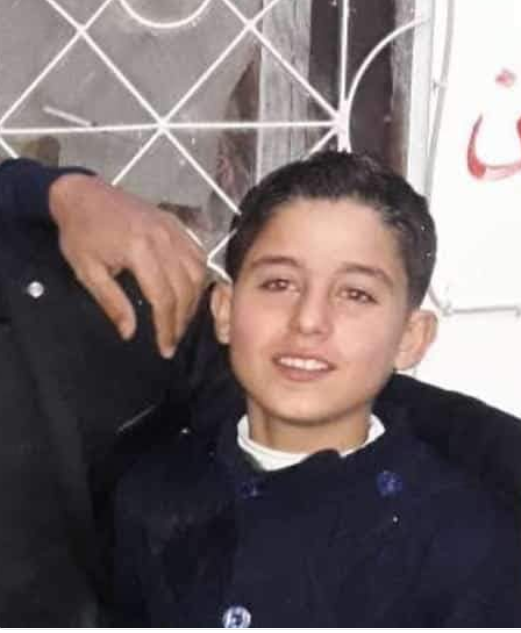 Once more, there was disagreement over responsibility: the Syrian Network for Human Rights named Mrs. Adiba Baroud as killed by a “regime missile launcher”, though Smart News reported that a child died in shelling by Russian forces. Multiple sources published graphic images of victims. Other victims were named as Huthayfa Diop (a young man), his daughter Hala Huthayfa Diop and another child, Muhammad Hassan al-Kurdi. In February, the situation in Libya remained unstable. There were 13 reported airstrikes conducted in various locations across the country. An ongoing military operation in the south by the rebel LNA intensified in the towns of Murzuq and Ghodwa. The LNA reportedly conducted 10 airstrikes in the region, including at El Fil, Murzuq and Ghodwa. Airwars recorded one instance of reported civilian harm from these LNA actions, with an elderly man claimed killed and a seven-year-old girl wounded in Murzuq town. Despite ongoing violence at Derna city, media coverage there remained poor. According to Human Rights Watch, as a result of clashes during February in the Old City, at least four women and three children were killed. Additionally, the US apparently conducted a covert airstrike on February 13th which targeted an al-Qaeda in the Islamic Maghreb (AQIM) convoy in Ubari town. Following the strike, the spokesman for the GNA publicly confirmed that the US had conducted the attack. However, when Airwars reached out to AFRICOM to seek confirmation, officials denied taking part in the raid. However, With the GNA standing by its statement that the US conducted the strike, this suggested the attack may have been a covert and undeclared mission by the CIA. Elsewhere, reports said an airstrike was conducted near the Libya-Egypt border; with the Egyptian air force blamed. Additionally, there was a strike carried out by an unknown party in Zliten city near Tripoli, in the west of Libya. February saw the Coalition concede 54 civilian additional deaths linked to the 2017 Battle of Raqqa, originating from six Airwars incident reports and one mass casualty event first published by Amnesty International.. These new admissions represented a 33% increase in the number of civilian deaths acknowledged by the international alliance for that battle. While the official death tally now stands at 159, this is far below the Airwars minimum estimate of 1,500 to 2,000 civilian deaths from Coalition actions at Raqqa. In total, Operation Inherent Resolve had recognised the deaths of at least 1,257 civilians across the four year campaign in Iraq and Syria to the end of February, noting that it was still investigating a further 182 alleged incidents of civilian harm. An Airwars animation of declared Operation Inherent Resolve strikes prior to December 2018 – when the Coalition stopped publishing the dates and locations of its actions – went viral in February. The original video and its call for the Coalition to reinstate transparency, saw more than 600,000 engagements across Twitter and Facebook, and was re-posted in multiple languages including Arabic, Turkish, French, Spanish and German. The awareness-raising video, created in collaboration with the Scottish design studio Rectangle, was picked up internationally by commentators, analysts and correspondents. In February, our Netherlands-based advocacy officer Maike Awater engaged with MPs from political parties in the Netherlands in preparation for a round table discussion with policy experts. This focused in particular on good practice examples of transparency and accountability policies from allies in the international Coalition against ISIS. Additionally, Maike met with other civic society actors in Belgium, to explore possible approaches to raising awareness of Belgian military transparency issues. With operational concerns often cited by the Belgium government as a reason for poor transparency, discussions focused on whether new opportunities for engagement might emerge once ISIS was defeated as a territorial entity. Also discussed was the importance of re-engaging in dialogue with political parties in Belgium during upcoming elections. Talks also included a discussion of standardised policies on civilian harm monitoring, assessments and compensation mechanisms for affected civilians on the battlefield. Additional reporting: Maike Awater, Sophie Dyer, and Osama Mansour. Conflict monitoring and assessments (February): Ali Abbas Ahmadi, Maike Awater, Poppy Bowers, Laura Bruun, Abbie Cheeseman, Sophie Dyer, Shihab Halep, Salim Habib, Harry Holmes, Alex Hopkins, Oliver Imhof, Osama Mansour, Hanna Rullmann, Abdulwahab Tahhan, Laurie Treffers, Clive Vella, and Anna Zahn.